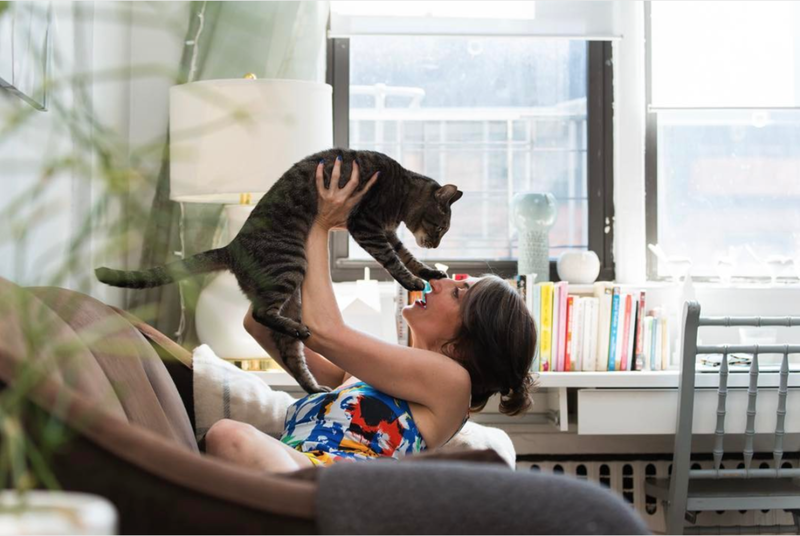 Today's 'Interviews With Cats' features Kip, the fur baby of one of our favorite fellow cat bloggers - Tamar Arslanian of "I Have Cat" and author of Shop Cats of New York! 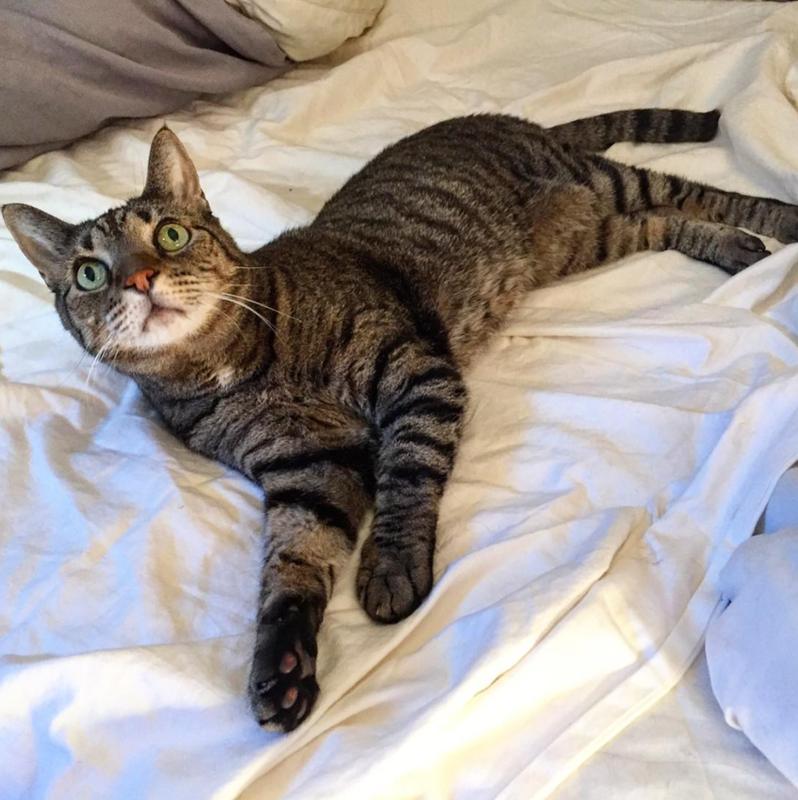 Kip is quite the little purr-sonality and you'll definitely want to read about his shenanigans here and follow their adventures over on Instagram. A: My name is Kip (aka Good looking, Kippie, Kipper, Kip Kip, Kippie-cat). You can find lots of photos of me on Instagram (search #kippiecat). I'm 14, we think, but since I was an adult rescue no one knows for sure. I live with my younger adopted sister Haddie, a foster fail (her doing not Mom's - she hid on adoption days so finally Mom gave up trying to find her and she stayed. Mom sometimes refers to her as "The Squatter"). Her Instagram tag is #misshaddie. We usually get along but she doesn't understand the concept of personal space. She always wants to be near me so I spend a lot of time having to move around. A man cat needs his space you know. She also likes to be groomed and just sticks her head in front of my face as her not-so-subtle way of letting me know (I think she gets that sort of direct approach from Mom. Not very nuanced). But she never reciprocates. Women. I used to have a younger brother Petie who died at the age of 10 (we think) from a cancerous mass in his chest last summer. He was always a loner but helped inspire Mom's blog ihavecat.com and is sort of the blog's mascot. I'm not totally convinced he was a cat. He looked like a stuffed animal but had very human eyes. Like a chubby human man trapped in a cat's body. His Instagram tag is #petiebear. A: It was given to me by the rescue group who found me. They say I was found in the Kips Bay neighborhood of Manhattan (obviously they are a bit short on creativity). But Mom liked it and I responded to it so it stuck. A: Well it happens once in a while. I get to roam around the hallways and stairwell of our apartment building. Always accompanied of course (Mom doesn't get the idea of privacy - sheesh! I'm a senior man cat!). I love rubbing up against the banisters and claiming them as mine. And while I'm embarrassed to admit it, sometimes I get confused and stand in front of the wrong door thinking it's my home. I start meowing really loudly until Mom has to pick me up and point me in the right direction. 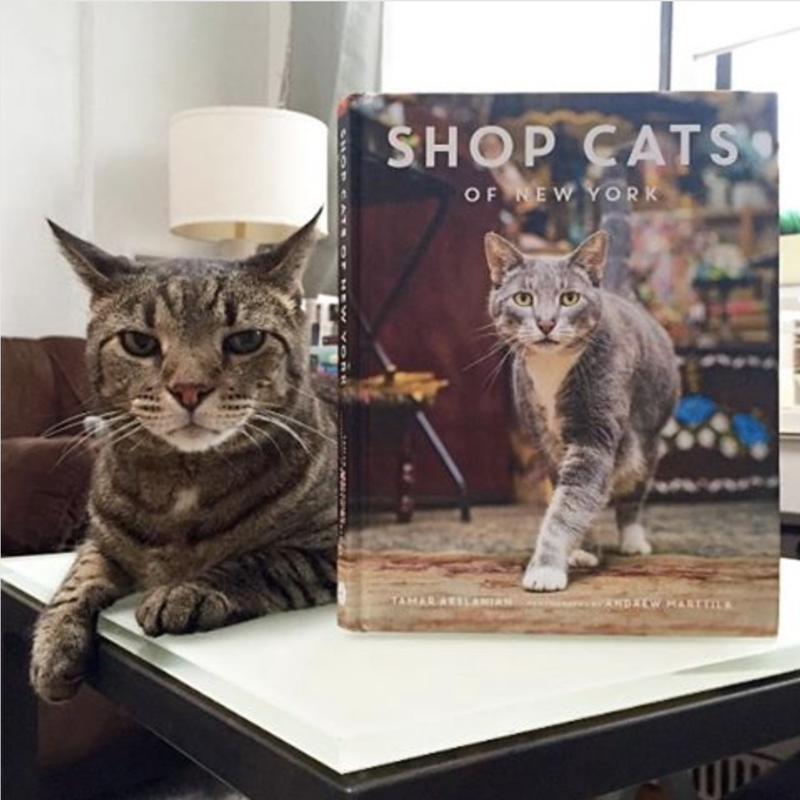 Oh, and I DID think I would be featured in Mom's book, Shop Cats of New York, so that was super exciting, until I realized I'm not a shop cat and couldn't be in it (though I'm technically in it because Mom is holding me in her author photo). A: The day Mom adopted me. I'm not sure how I ended up in that cage at Petco because I don't remember much about life before Mom. They say I was about 2 years old at the time. Don't tell her but I tricked her into adopting me (I think maybe it's illegal? Something about impersonation or fraud?). She wanted a lap cat so I pretended to be one and she fell for it! But the minute she got me home I started zipping around making her play with me and never sat in her lap. Now that I'm older I've grown to appreciate some Mommy lap time (on my terms of course). A: I like anything that's super unhealthy (according to Mom). I don't really like human food unless it's a carb. I think I'm what the humans call a carboholic (though Mom rarely gives us dry food). I really like crushed-up water crackers, potato chips and saltines. And licking any kind of bread. I don't exactly know why. A: I get yelled at a lot for scratching up the sofa and chaise lounge but pay no mind. Mom taught me to use the cat scratchers and gave me treats whenever I used them. So now whenever I want a treat, I use a cat scratcher. She doesn't seem amused but I'm unsure of what she intended to happen. It's like a treat bell. A: I don't like human holidays because it usually entails Mom trying to get some sort of themed photo of me. Sometimes this means I have to wear a silly hat or sit still next to some sort of prop. It's usually me because Haddie doesn't tolerate those sort of shenanigans. Since I ruin Mom's furniture I guess letting her do it to me is penance. A: A tiger. Or lion. I'm not picky. A: iPhone recharger cords and earbud cords. I like the way they move. The more expensive the better. A: Looking devastatingly handsome, finding new and ingenious ways to destroy the furniture (who says microsuede is hard to destroy - amateurs!). Oh, and I move the tip of my tail when Mom says my name but not when she tries to trick me by saying other names (though I must admit if it rhymes with my name I sometimes fall for it. Shameful I know.). Q: What do you do that annoys your meowmy? A: See "scratching furniture" above. Oh, and when she's in bed ready to go to sleep and I throw up on the bed cover. When ya gotta go, ya gotta go. A: Given the limitations of living in. New York City apartment I'd have to say Haddie and my Mom. There was a pigeon that used to visit the fire escape....he must have moved on...sigh. A: See "scratching furniture" above, sleeping and generally looking handsome. A: I may be going senile - or at least that's what Mom thinks, because I've started meowing for no apparent reason. Usually at night. She took me to the vet and I'm a healthy kitty. Don't tell her but I just do it because I like getting her out of bed for a little one-on-one time. It also keeps her on her toes. Shhhhh.